I'm so stuck in the nineteenth century with my reading at the moment I'm thinking I may purchase nine yards of sprigged muslin and run up a new gown.Perhaps bombazine (why do I think a bolt of that could explode?) might be more practical now that winter has finally hit the West Country and I'd certainly need a calash or two to cope with the rain down here.If the cat eats the lace Cranford-style I'll do without I can promise you that.I'm giving orders to cook each day and going out calling and leaving cards every afternoon. I'm certainly not safe with a book called The Sickroom in Victorian Fiction, The Art of Being ill by Miriam Bailin.I tend to wade in and unhinge all the arguments in these wonderfully erudite books, make them fit what I'm reading, but my eyes have been on stalks of incredulity with this book, so much that had just never occurred to me before. 'The pervasive presence of the sickroom scene in Victorian fiction' just mention the words and suddenly I'm noticing sickrooms all over the place and sitting up and taking more notice of what's going in them. It's not just about women writers employing particular diseases that reflected women's social roles, like anorexia or a touch of hysteria, oh no indeed and it's not just the women writers who used the device.Thackeray, Dickens and Kingsley took their characters to the sickroom as often as Bronte, Eliot and Gaskell. 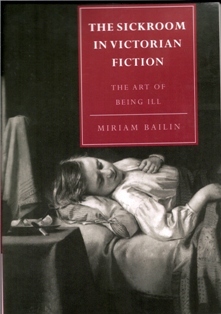 As Miriam Bailin explains, 'the sickroom in Victorian fiction is a haven of comfort, order and natural affection', so much so that it's almost preferable to stay there. The normal social boundaries shift and illness becomes an escape, a refuge from the constraints of society and often held benefits far in excess to those of being well. For girls apparently invalidism was often a foolproof incentive for attracting the attention of a busy father, well retrospectively now I see something I hadn't really taken that much notice of before. Elizabeth Gaskell seems to hold the record for sickroom scenes because Ruth contains no less than twelve and of course nursing the sick was the ultimate act of saintliness, a suffering in itself. I've only read the first fifty pages of this very readable book, I skipped the odd paragraph that felt a bit doctoral-thesis-y and that wasn't an excessive amount and I'm looking forward to moving onto chapters about the writing of Charlotte Bronte, Dickens and Eliot eventually. Meanwhile I'm playing Spot the Sickroom swiftly followed by What's Going On in the Sickroom and Who's Mopping Which Brow and already it's proving very interesting.Bleak House, my Dickens of a Read probably has plenty of sickrooms for me to wander through and my read of that will begin once Christmas does. That's Wednesday evening here and some holiday from work.Christmas not the happiest time for so many families and a lot of fire-fighting goes on at the front line.I'm relieved not to be sitting by the phone holding my breath and praying it doesn't ring on Christmas Eve this year, but like all good teams we share the load so I shall be sitting there on New Year's Eve from 9am to 5pm thinking the same.